You can connect unlimited apps and services via Zapier, and send data right into Flexie CRM. With today’s demand to make data available from any possible source, many tasks that are done frequently can to be automated. Integration with Zapier allows you to connect to a lot more sources. With Zapier you can create Zaps which can automate task for your business. Each Zap created starts with a trigger from one Zapier app, where the information comes from. The trigger causes one or more actions in other Zapier apps, where your data is being sent automatically. We provide Triggers and Actions for Flexie Entities and Custom Entities in order to make data available to you. Using Zapier Integration, whenever an event is triggered, a corresponding action will run automatically. Lead Added – Triggers when new lead is added in Flexie CRM. Contact Added – Triggers when new contact is added in Flexie CRM. Deal Added – Triggers when new deal is added in Flexie CRM. Account Added – Triggers when new account is added in Flexie CRM. Custom Entity Added – Triggers when a new Custom Entity record is created in Flexie CRM. Custom Entity Updated – Triggers when a Custom Entity record is updated in Flexie CRM. Create Lead – Creates a new lead in Flexie CRM. Create Contact – Creates a new contact in Flexie CRM. Create Deal – Creates a new deal in Flexie CRM. Create Account – Creates a new deal in Flexie CRM. Create Custom Entity – Creates a custom entity record in Flexie CRM. Custom Entity Updated – Updates Custom Entity in Flexie CRM. The operation is performed by sending a unique identifier along with the fields you will update in Flexie CRM. The unique identifier is a unique field for the entity that you have setup for the Custom Entity in Flexie CRM. 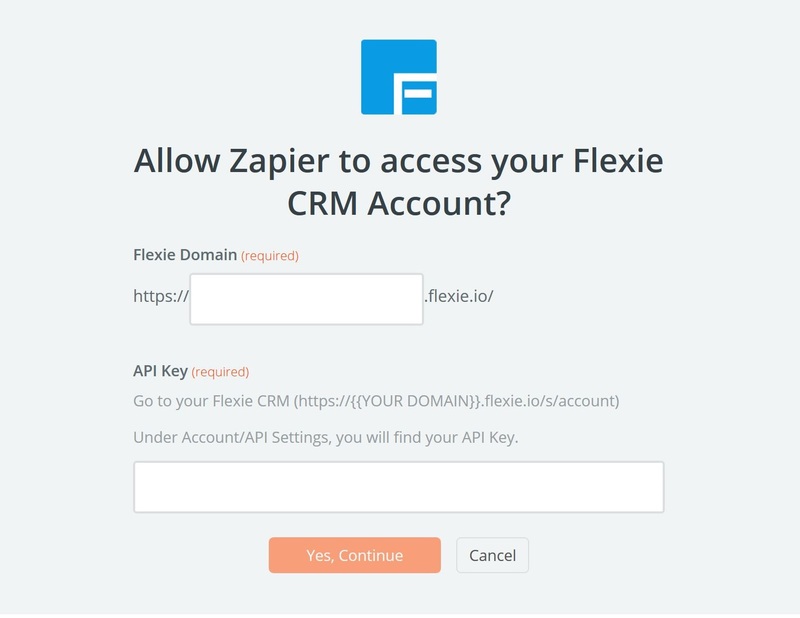 Flexie CRM app in Zapier is public and has ready to use templates from which you can use. Before creating a new Zap that in other words is a Zapier Integration, you need to allow Zapier to access your Flexie CRM Account. You have to manually enter your Flexie Domain and API Key. You can find your API Key by going to Account / API Settings in Flexie as shown below. 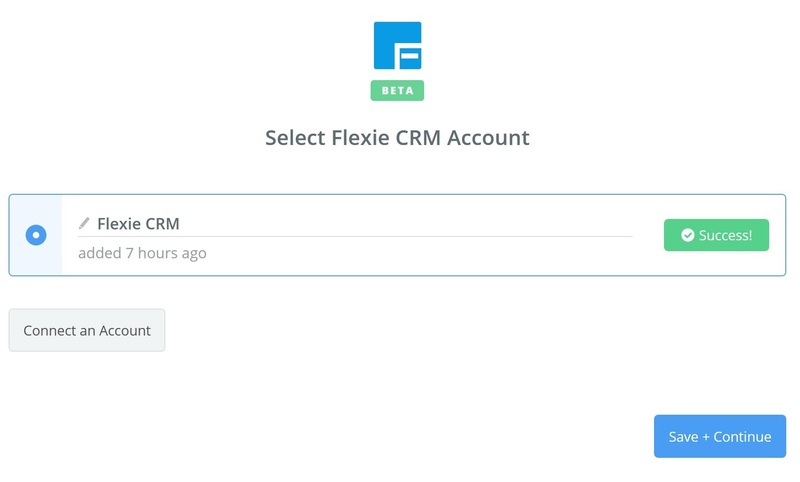 Start to create a Flexie CRM Zap and you will be asked to connect a new Flexie account. When you click Connect an Account, you will be asked to enter your Flexie Subdomain and Flexie CRM API Key. Type in the Subdomain and the API Key. 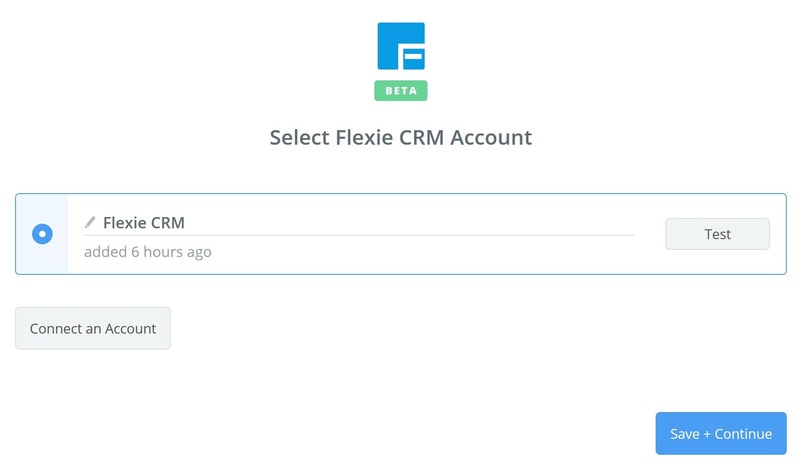 Now you connected Flexie CRM with Zapier. This account is available for the other Zapier Integrations you will create where you will use Flexie CRM app. You can see your Flexie CRM app account in Zapier Dashboard / Connected Accounts. To test your account, press the button Test. If successful, it will look like below. Now that we successfully connected to Zapier, let’s create some cool Zaps to send data in and out Flexie. You can find ready to use templates below and choose from any of them.